Today’s truck market is filled with contradictory information. One source says that last month’s freight grew at two percent while another says it declined by two percent. In reality, the general economy is growing, but at a slow rate and we are not seeing any big swings in freight one way or the other. In the years following the Great Recession, including 2016, we have had record deliveries of all type of vehicles as fleets updated the tractors and trailers they allowed to age during tough economic times. As we sit today, it looks like freight is slowing down a bit and we have some excess capacity in the market. Truck manufacturers are cutting build rates and order boards are not out as far out as they have been. Truck production continues to outstrip demand, and recently truck makers have announced they are cutting production capacity. This is in part a reaction to a slowdown of other types of product manufacturers that are dialing back their demand. Lower fuel prices are both a blessing and a curse for fleets. Fuel is the second biggest expense item for fleets; only drivers’ wages and benefits account for more. Lower fuel costs means lower cost of operation. However, when fuel prices are high, fleets institute fuel surcharges, which actually provide them with a revenue source. Low fuel costs mean no fuel surcharges and therefore, no additional revenue stream. On-board electronic logging devices are being mandated as of December 2017. One of the impacts of this will be the departure of some of the smaller carriers from the market either because they will not be able to afford the devices, or because they will be unprofitable when forced to adhere 100% to the Hours of Service (HOS) rules. As a result, capacity will be taken out of the market and larger fleets will have the opportunity to pick up additional business. Looming large are the Greenhouse Gas Phase 2 regulations. Although final regulations have not been issued, there is no doubt that a significant reduction in CO2 will be part of the final rule. The only way to cut CO2 emissions is to get more miles out of each gallon of diesel fuel. 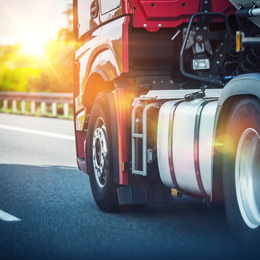 As truck, engine, and trailer manufacturers develop ways to meet the regulations, there will undoubtedly be cost associated with the technological changes they select — a cost that will most likely be passed along to the truck buyer. The savings from increased MPGs, however, should help offset that increased initial purchase price of the equipment. Another uncertainty in the market is the upcoming elections. How will the final results impact trucking? If we get a conservative or a liberal government in place, how does that play a role in the economy and by extension, in the trucking industry? Obviously the availability of financing plays a role in vehicle purchases, as does the cost of money. Interest rates are extremely low right now. From a financial standpoint, you are doing exceptionally well with any equipment you finance in this current environment as compared to years gone by. As interest rates start to rise, that will become a factor for fleets deciding to keep a piece of equipment for an additional six to twelve months. But until we see a half percent or a full percent jump in interest rates, it won’t as weigh heavily in the purchase equation as the upfront cost of the equipment. Looking further out to the future, the cost impact of meeting GHG 2 is concerning. Will equipment cost $3,000 more or $30,000 more? This will have a greater effect on asset replacement than a 50 basis point increase in interest rates. So what does all this mean in terms of tractor and trailer sales? For 2016, Class 8 truck purchases will not reach the 240,000 levels as they did in 2014 and 2015. I anticipate sales of 190,000 trucks for the year, or a decrease of 10%, and possibly as high as 20% compared to the recent peak years. In the medium-duty arena (Classes 6 and 7), we are seeing phenomenal growth — in the 14% range year-over-year. A great deal of the demand for these trucks is being driven by the housing and construction segments of the economy. As long as these markets stay strong, there will be good, healthy volume out of the Class 6 and 7 markets. Trailer orders remain fairly strong, but not as strong as they were in 2014 and 2015. However, fleets are still taking delivery of huge volumes of new trailers and used trailer prices remain exceptionally strong. One of the consequences of the increased purchasing in recent years is the amount of trucks on the used truck market. That has resulted in depressed used truck prices, but interestingly, we are on track to sell just about the same number of used units as we sold last year. The good news is, with a slowing in new truck sales, we will see a corresponding slowing of trucks hitting the used truck market. The spigot will start to turn off slowly as the balance of the year progresses and we should see a rebound in used truck prices late in the fourth quarter, or early in 2017. I think people are cautiously optimistic for the remainder of 2016. It seems we are taking a bit of a pause this year with regard to equipment deliveries. However, I believe manufacturing will continue to grow at a modest rate and new truck deliveries are going to be off peak, but still strong. Remember that fleets still have access to bonus depreciation, which was reauthorized at 50% for 2016 and will slowly whittle down in 2017 and 2018, then back to zero. There is still a good tax benefit associated with equipment replacement along with low interest rates and the current relatively low cost of equipment. Now is a great time for fleets to evaluate their current assets to determine which need to be replaced because there is not going to be a reduction in interest rates or a lowering of cost for the new assets. Fleets should “double down” when evaluating when is the right time to replace assets. Can they take advantage of the current financing environments, bonus depreciation, low interest rates, decent upfront costs and decent residuals? They need to look at each of these factors and determine how they affect their fleet today, and over the next five years; purchasing decisions should be based on what the data tells them is right for their specific operation. The balance of 2016 is a mixed bag and there are uncertainties looming for 2017 and beyond. Smart fleets will begin to prepare now for future inevitabilities so they are well positioned to be successful. Patrick Gaskins is Senior Vice President of Financial Services with AmeriQuest Transportation Services. In his role, he oversees the sales and syndications functions for the Financial Services division of AmeriQuest. Gaskins has over 25 years of experience as a financial services professional in the transportation industry. Prior to joining AmeriQuest, he held financial services positions with First Fleet and GE Capital. Gaskins earned his BBA in Finance from the University of Miami, FL in 1989 and received his CTP certification from the National Private Truck Council in 2002. He also holds a commercial pilots license.